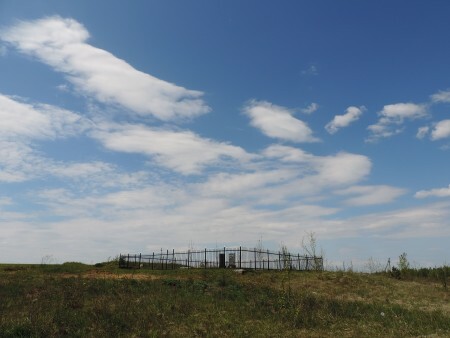 On 22 June 2015, the President of Belarus, Alexander Lukashenko opened a new memorial complex at the site of the former extermination camp Maly Trostenets near Minsk. 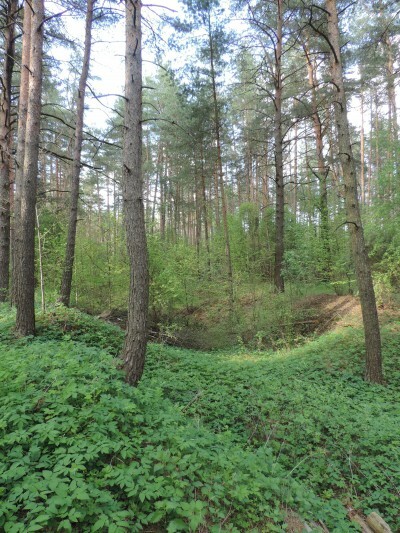 Between 1941 and 1944, German occupants and their helpers interned and killed up to 206,500 people in this camp and in the nearby forest of Blagovshchina. The memorial complex marks the site of the largest extermination camp in German-occupied Soviet territories, but also commemorates victims throughout Belarus and its six oblasty (regions). The opening ceremony marked a milestone for Belarus’ memory of the Nazi genocide. 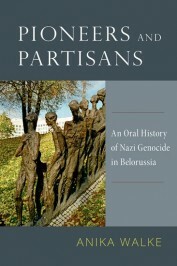 While the victory of Soviet troops over the Nazi regime has formed the core of republican and national identity—first in the Belorussian Soviet Socialist Republic (BSSR), and then in the Republic of Belarus since 1991—the systematic extermination of civilians has often retreated into the background of official commemorations. Partisans, i.e. civilians or soldiers-turned-guerrilla fighters, many of whom are remembered as heroes, personified the history and memory of Belorussian people’s experience during World War II, and monuments to partisans and soldiers are a ubiquitous feature of Belorussian town and city landscapes. The memory of civilians, however, has largely been confined to the site of Khatyn, a village about 40 miles to the north of Minsk (not to be confused with a place of the same name near Smolensk). Like 185 other villages, a German punitive squad scorched Khatyn in 1943, with its residents burned alive in a barn. In 1969, a memorial complex was dedicated at the site. It is thus commendable that the systematic killings of civilians behind the frontline are now included in the state-sanctioned narrative of history and commemorated within reach of public transportation. The memorial complex at Maly Trostenets along the Doroga Pamiati, or Road of Memory. Photo by Anika Walke. Nonetheless, the memorial in Maly Trostenets reveals continuing rifts and omissions in public discourses about the past. 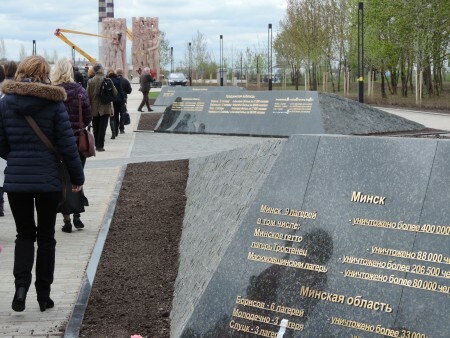 Plaques along the “Road of Memory” list the number of victims in central towns and regions such as Minsk and Minsk oblast (region), differentiating between towns, major camps, and ghettos. None of the plaques, however, mention that in ghettos and camps, such as those in Maly Trostenets, the majority of victims were Jewish. It is old news that formerly Soviet countries have denied the Holocaust, the systematic murder of European Jewry, a special place in the memory of World War II. Attempts to explain this ignorance typically assign blame to Soviet antisemitism and nationality policies that strove to devalue national particularity and promote Soviet unity. Indeed, one must recognize that, in a country where German occupation and Nazi genocide destroyed up to a quarter of the prewar population of nine million, the killing of about 800,000 local Jews and Jews from various European countries deported to the killing sites in present-day Belarus, of Roma—as well as mentally ill people, homosexuals, and other groups targeted by the Nazi regime—are seen as part of all-encompassing suffering, though their silencing is certainly related to current resentments as well. And yet the dynamics of the extermination campaign reveal that the killing of Jews raises thorny questions about local cooperation and collaboration. The number of Belorussians who helped identify, arrest, and even shoot their neighbors, coworkers, or classmates, is yet to be determined. And while this number is likely smaller than, for instance, that of Ukraine or Lithuania, this number challenges the core of Belorussian memory and identity as the victorious victim. Thus, denying Jews their proper name is an easy way to avoid questioning national unity and continuing ruptures. A mass grave of 150 Jews, murdered on 16 March 1942, near Slavnoe, Vitebsk region. Photo by Anika Walke. Alongside vestiges of antisemitism and forced unity, Belorussian society may suffer from a traumatic loss that is much harder to pinpoint. The country’s territory was part of the former Pale of Settlement, the only section of the Russian empire where Jewish subjects of the Tsar were allowed to reside. Belorussian culture was therefore heavily influenced by Jewish culture and heritage, including food preparation or ways of production. Perhaps the trauma of the mass murder of Jews cannot be articulated because it would require recognition that the murder produced loss and suffering for the whole country, not solely for an identifiable community within. The massive loss of life during World War II was overwhelming, in part because it took place not on some battlefield far away from home, but right there, in and around people’s hometowns. The graves are everywhere. Unfortunately, not all of them are marked. Jewish mass graves—often sites where people were shot at natural ditches or anti-tank trenches—in many instances remained unmarked during Soviet times; memorial stones, if local authorities granted permission for their erection, spoke of “innocent Soviet citizens.” In recent years, diaspora communities or remaining survivors have taken care to mark the mass graves and commemorate those who were shot by name and note the reason for their murder—their Jewish origin. A foxhole along the line of defense during the summer of 1941, near Beshenkovichi, Vitebsk region. Photo by Anika Walke. Similarly, Soviet soldiers who fell in the first days and weeks of the war were often buried on the spot, with their gravesites scarcely marked, or completely obliterated when future battles rolled over them. Until today, the remains of these soldiers lie scattered in the soil of Belarus and other parts of the former Soviet Union. Local activists study the course of the war, visit known and likely battle positions, and literally dig, unearthing bones, dog tags, or equipment. Then, volunteers help fill a database that allows families to finally learn the fate of their loved ones, an important complement to the stone monuments of fighters and heroes. The difficulties of remembering genocide and war are evident in the tedious work of projects like Yahad In-Unum, a French-led initiative to identify and mark execution sites of Jews in Eastern Europe, not to mention the efforts of local groups working to note where Soviet soldiers died. When the graves are everywhere, they are often nowhere. The catastrophe of World War II in the Soviet Union, with up to 26 million military and civilian casualties in total, is a catastrophe for memory and commemoration. Belarus shows that remembering the casualties of World War II, and other instances of systematic violence, reflects present conditions and conflicts—who is remembered, in what way, and where, whether in public or in private. Moreover, mass violence and destruction are difficult legacies for any society; the Holocaust, the genocide in Rwanda, and the mass killing of Bosnians by Serbian troops all question the validity of moral norms, challenge legal frameworks, and complicate social relationships. The “Roads of Memory” of Maly Trostenets and elsewhere are long and bumpy, but there is hope that they will open conversations along the way that facilitate recognition for everyone, despite and because of their particular identity and experience. Image Credit: In Khatyn, a monument stands in remembrance of 186 villages that were destroyed by a German punitive squad in 1943. Photo by Anika Walke. Anika Walke is Assistant Professor of History at Washington University in St. Louis and author of Pioneers and Partisans: An Oral History of Nazi Genocide in Belorussia.